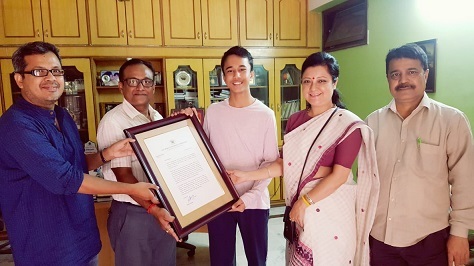 Kaustav B Arya, a Class IX student of Assam Jatiya Vidyalaya in Guwahati, who was recently invited to participate in the ’31st Material Science Conference: Advancement and Innovations’ held in Finland and the ‘World Magnetic Material Summit’ held in Italy, has been appreciated by Congress president Rahul Gandhi. Kaustav was selected to participate in the two international conferences for his research works in ‘Naval Vest’ and ‘Theory of Direction’. While the conference in Finland began on October 15, the conference in Italy began from October 21. The Assam Pradesh Congress Committee (PCC) Outreach Team including Assam Pradesh Congress Committee (APCC) senior spokesperson Bobbeeta Sharma, delivered the letter of appreciation from Congress President Rahul Gandhi to Kaustav B Arya on being selected to the international science meets in Finland and Italy for his research works. Congress president Rahul Gandhi, while referring to Kaustav’s earlier invention ‘Horn for the Deaf: A Sensitive Gadget’, stated that the “device for the hearing impaired was also a commendable initiative”.